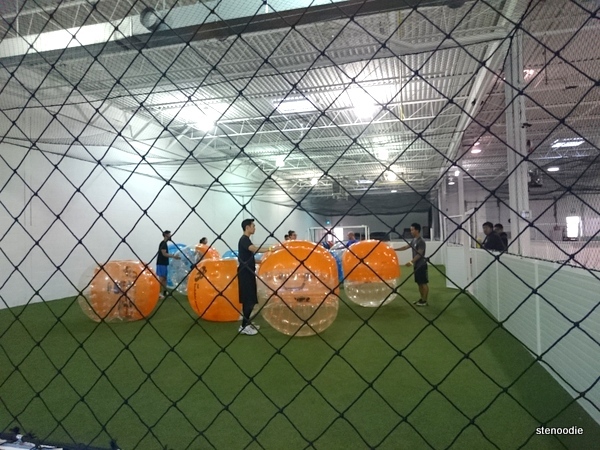 First Time Playing Bubble Soccer at AT Bubble Soccer! We had exactly 12 players that day. 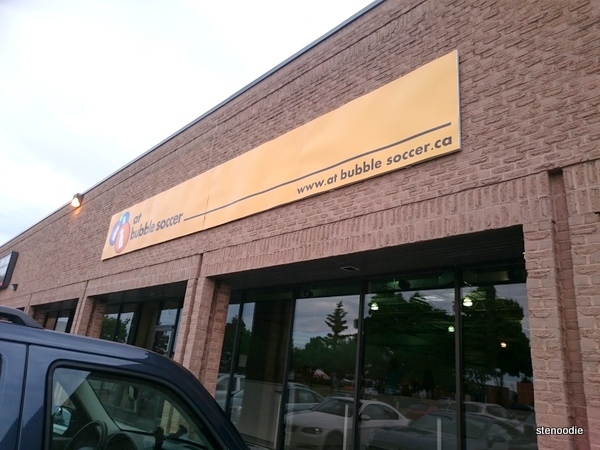 AT Bubble Soccer is located at 1300 Alness Street near Steeles Avenue and Dufferin in Vaughan. After checking in on a tablet to sign the wavier, we were given a yellow wristband to wear. Our game was to start at 7 p.m on a weekday Tuesday. Once everyone in our group had arrived, we entered the soccer field. It was enclosed with a safety net. There was a group playing before us and while they were playing, I took some photos and videos. I was excited to try this for the first time! The lady explained to us some rules of the game, which included no forceful bumping into each other and no bumping from the back. Then we put on the bubbles just like a backpack. 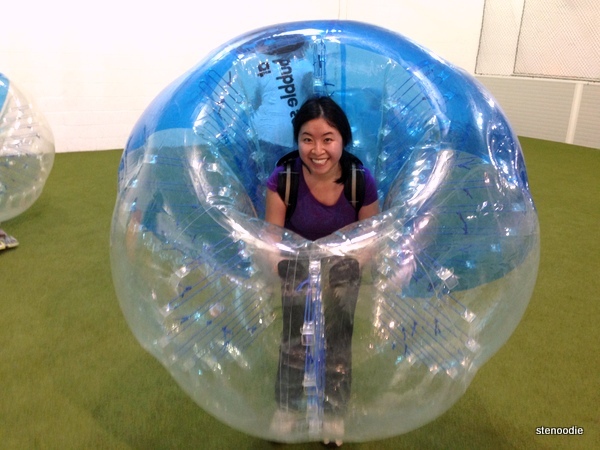 It was a little unnatural to worm myself into the inside of the bubble haha. 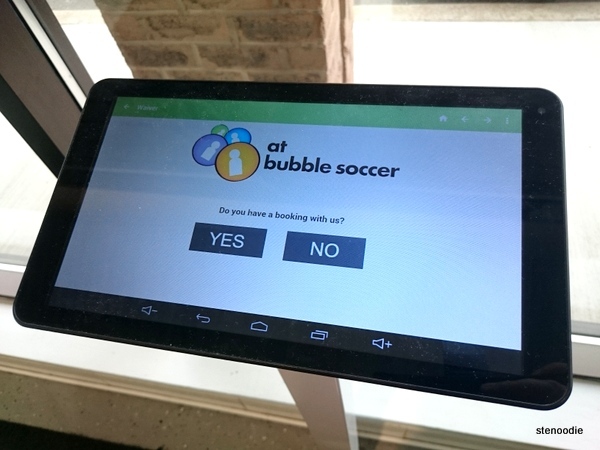 After a few seconds of putting on the bubble, you immediately feel the weight of it. Considering that it was just a bubble full of air, it actually feels like it weighs a lot! 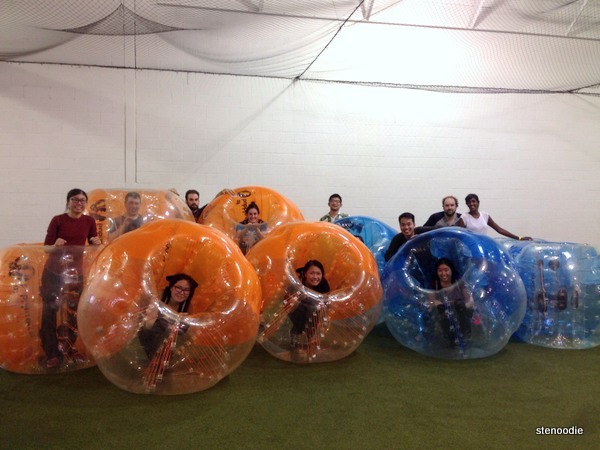 After the teams were chosen and we started playing, we could all really feel the weight of the bubble. It was heavy! It was especially hard since the only air circulation was from the top of the bubble where there was a hole for your head so it made breathing more strenuous than usual too. After the first break, we went back in to play again. I do admit it was really, really fun! It was like playing soccer back in elementary school. There weren’t rules and everyone just worked together in their team to try to kick the soccer ball into the net of the other team. We then took our second break where everyone was so sweaty like we had come from a gym. Once we went back into the soccer field, we were told that we only had six minutes left in our 50-minute game. Wow! Time just flew by! Group shot after our game! 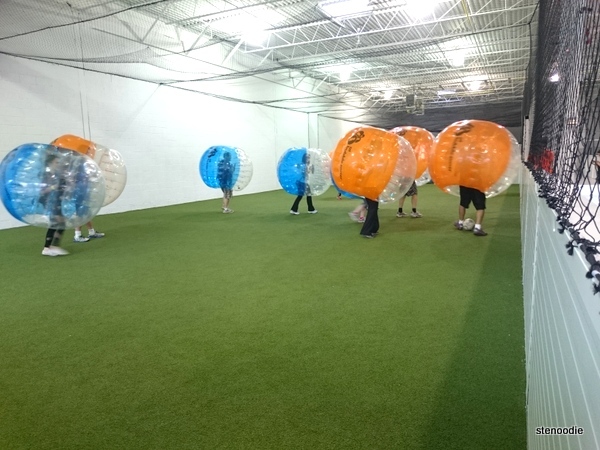 This entry was posted in New Experiences and tagged 1300 Alness Street Unit 3, @atbubblesoccer twitter, AT Bubble Soccer, bubble soccer reviews, bubble soccer Toronto, do you fall at bubble soccer, first time playing bubble soccer, fun birthday ideas in Vaughan, fun team building games in Toronto, Vaughan, where to play bubble soccer in Toronto. Bookmark the permalink. 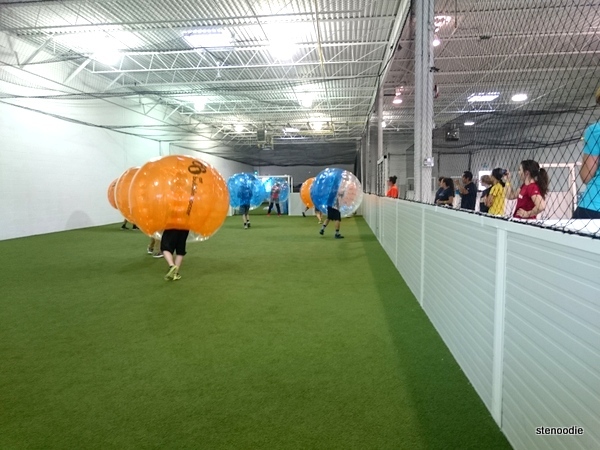 3 Responses to First Time Playing Bubble Soccer at AT Bubble Soccer! This looks soooo cool!! One day, I would like to try it!